Please refer to our stock # 300 when inquiring. A fine Japanese antique Satsuma tripod koro with lid. Decorated on one side with a group of children playing and on the other side a garden scene with flowers against a fence. 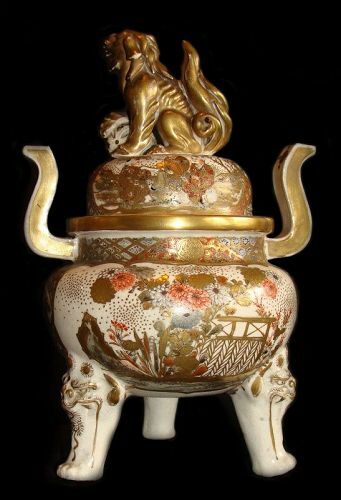 The domed cover decorated the same with a seated foo dog finial resting on a ball. Resting on three animal head legs. All highlighted with gilt. Condition: Very good condition. There is a small chip on the mane and the tail of the foo dog.